Located less than 20-minutes from downtown Dubai, Dubai Hills Golf Club is located in the heart of the elegant Dubai Hills Estate. 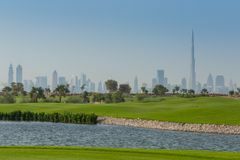 With blue skies overhead and the city of Dubai rising up in the background, Dubai Hills is the ideal golf course for those staying near the city. Dubai Hills is one of the newest additions to the phenomenal portfolio of golf that Dubai already boasts. Suitable for golfers of all abilities, the use of water and bunkering makes this course a visual treat. Whilst this par-72 gem can be played by golfers of any calibre, Dubai Hills is no pushover, measuring a solid 7220-yards from the tips. Sculpted out of the desert sands of Dubai, the course is built to a championship standard and manicured to an impeccable standard. The fairways are often wide and sweeping, however, the use of bunkering and water hazards means that an emphasis is placed on good approach play. Arrived and met by receptionist who directed us to buggies etc. She failed to tell us the correct route and that the buggies stopped if in the wrong area. After push back all went well. We played of Blue tees as the course is not overlong, but the greens were very quick and this is where the difficulty of the course is. Very enjoyable and good open course which will suit most golfers and ladies. Would certainly play again if in Dubai.